Parking lot striping that is clean, sharp, and fresh is a great way to keep the exterior of your business looking amazing and inviting to guests to your Tulsa location. Many companies overlook this area as a way to instantly attract customers to their business. When people see that you invest in the outer appearance of your parking area, know that you are a serious business owner. Also when your parking is well maintained, you are providing safety for all visitors to our business parking area or parking garage. When people know the flow of traffic, and where to park or not to park their vehicle everyone stays safe. Providing quality striping is very important for the integrity of our company. We pride ourselves in painting the straightest lines in all of Oklahoma. We use the highest quality parking lot paint that is traffic grade so that it will last and protect your investment. The paint will apply evenly, and we ensure all stripes are uniform in width, height, and color. We know based on experience an having many parking lot striping jobs under our belt that using the best quality materials and equipment will ensure a successful outcome every time. 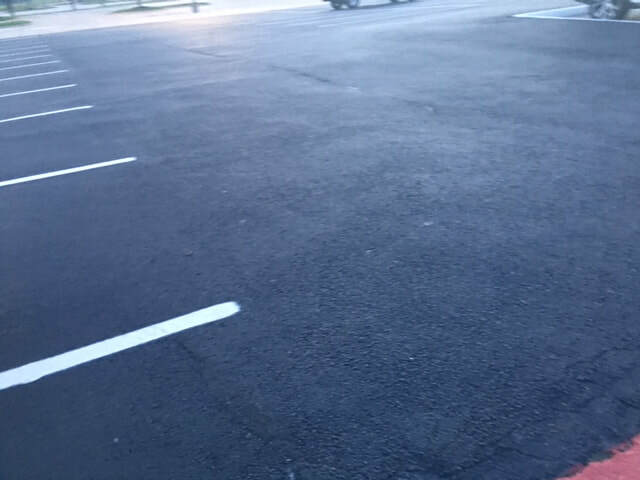 Striping a parking lot does take skill and experience to paint straight lines. We have been striping for a long time, and our expertise and professionalism will show in the quality of work that we perform. No matter if your parking lot is cement or asphalt, we will do a fantastic job every time, and your parking lot will look spectacular. For all parking maintenance service needs, we are your one-stop-shop. We can help you with everything you can imagine in your parking area. From full parking lot repairs to continued maintenance we are here to assist no matter how larger or small the job may be. We would love to discuss with you the option of starting a scheduled maintenance program because just like any structure proper maintenance of your lot will help with ensured life expectancy. Also rest assured, we take your schedule and flow of traffic into consideration before coming out to start the job. We will work with you or your business representative to make sure our work will not disrupt your normal flow of traffic during the day. 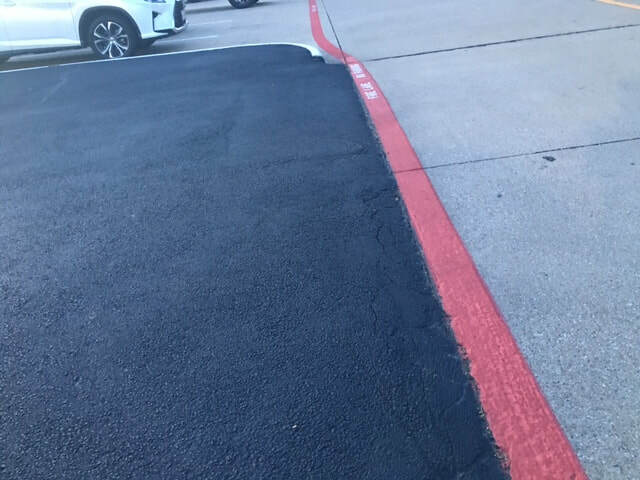 If we can section off your parking lot, and stripe in sections we will do that, however, if the lot is super busy we may need to schedule to stripe the lot during the evening hours. This is something we will determine with you before starting the job. Specific regulations have been put in place by The American Disabilities Act (ADA) way back in 1990. 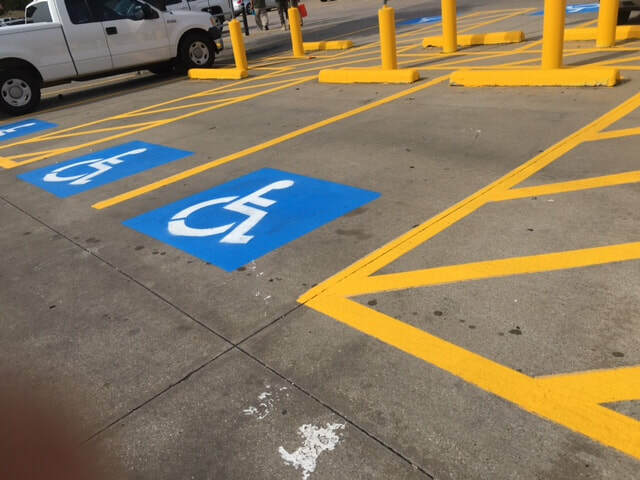 All parking lots will need to be ADA compliant to pass inspection. 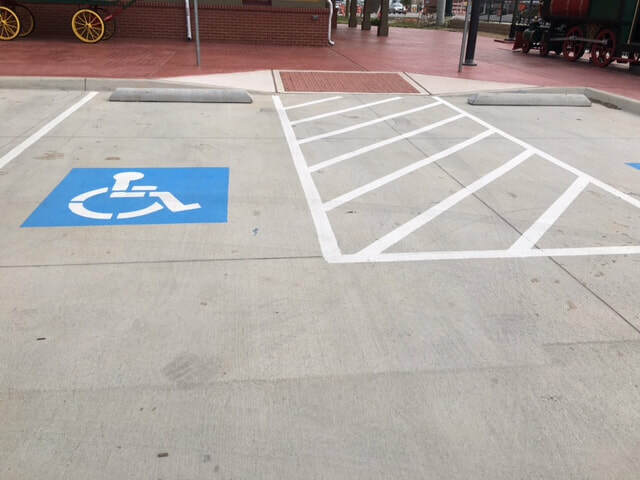 The ADA requires that you have a specific number of handicap accessible parking stalls, and the amount of spaces is based on the size and number of available parking spaces in your lot. The handicap parking stalls have specific requirements as to where they can be located, and how big they should be. Our parking lot striping professionals will make sure that your lot is compliant so that you can pass inspection. 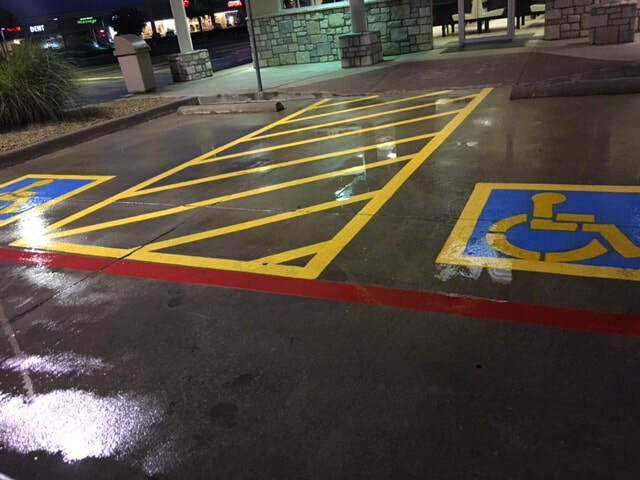 We have all of the proper ADA approved stencils and paint to stripe your parking lot accurately, and appropriately. If you have any questions, or if you would like a free quote, please contact us today. We will be glad to discuss with you the requirements you will face regarding staying ADA compliant. We have all seen the bright red fire lanes with the words “NO PARKING FIRE LANE” stenciled nicely onto the red paint. These lines are not here just to look pretty, they are here for compliance and safety reasons. By having these no parking areas, around the perimeter of your parking lot, you and your building, you are ensuring that there will be proper access for emergency vehicles (Fire, Ambulance, and police) in the event of a fire emergency. All fire lanes must be striped properly and also stay maintained. If you have received a visit from the local fire marshal be sure to contact us, and we can get you back into compliance. 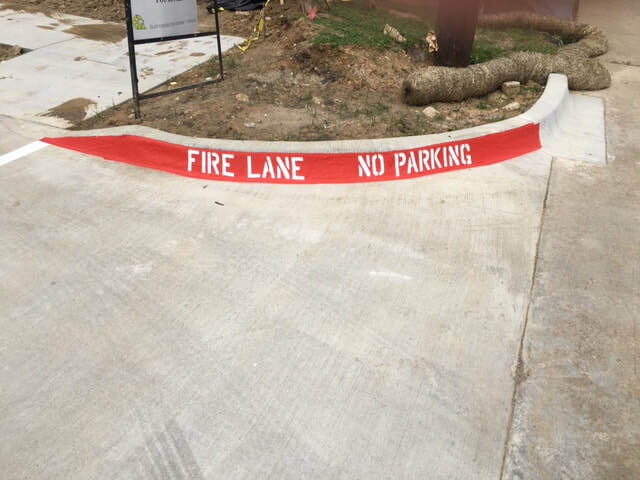 If you are proactive and know that your fire lanes need to be re-striped, give us a call as well, and we will repaint all of your fire lanes, so you do not get that dreaded visit and fine. Wheel Stops are a safety feature and are mostly installed to prevent vehicles from causing damage to buildings, walls, and other vehicles, as well as to keep them off of sidewalks and walkways. Also known as car stops, or parking blocks, installing car stops is an alternative to installing curbs around the property. Wheel stops are made from different materials, but you will mostly find them made of concrete, rubber, steel, and even plastic. Depending on your needs and budget, you can find a wheel stop that will fit best in your lot. We can help you pick the right type of car stops, and we also do the installation for you. Although Wheel stops are a safety feature to help prevent damage, they can also be a tripping hazard for pedestrians if not appropriately placed. Car stops should never be placed in a walkway or a pedestrian path and should also be illuminated suitably and painted to contrast their surroundings to help prevent tripping. Speed bumps are for safety reasons only, so having some in your parking lot is always a good thing, especially if you have a larger parking area. When drivers are not speeding through the parking lot, there will be less of a chance for accidents. The last thing you want to see is two vehicles crashing into each other, or even worse a pedestrian getting struck by a speeding car. Speed bumps for sure make drivers slow down while in the lot, but the speed bumps do need to be visible so that they are easily seen. If the parking speed bumps are easy to understand then pedestrians will not trip over them nor will drivers hit them too fast, which could cause significant damage to their car. Having a professional installer on site to install the speed bumps is essential. Our drivers have experience installing may time of speed bumps including concrete, rubber, and asphalt speed bumps. We can also help maintain your current speed bumps to ensure they last as long as possible. If you have any questions about speed bumps be sure to ask us when you call or while we are onsite. We will be glad to assist you in selecting the best speed bumps to fit your design, budget, and needs. Bollards are used as an effective vehicle barrier and can be used in place of wheel stops as long as they are centered at the heads of parking stalls. Bollards can be decorative as well, and also can have lights installed to help light up dimly lit areas. Bollards primary function is to help protect property from damage due to vehicles. Let’s face it vehicle accidents happen all the time, and it is effortless for crashes to occur in parking lots where cars try to get close to specific structures. For instance, banks and drive-thru restaurants typically install bollards to protect their ATMs and drive through menus from accidentally being hit by cars. Many dumpster areas have bollards installed to protect against the dumpster truck unexpectedly crashing into the dumpster pad wall. Fire hydrants, utility poles, gas pumps and so many other things can be protected by bollards. You will typically find decorative bollards at the entrances to office buildings. The designs of the bollards can significantly complement the architecture of the building. You may also see decorative bollards along pathways, or around ponds, and other pedestrian areas. Our professionals are ready to install bollards in your parking lot, and around your business. Call us today, and we will be glad to discuss and come out to give you a free quote. Continued maintenance on your asphalt is necessary to protect your investment and to ensure that your asphalt parking lot will last a very long time. You should apply a seal coat to your new asphalt surface within the first year, and then every 2-3 years after that. The seal coat is a protective covering that is applied to the top layer of asphalt that acts as a weatherproofing barrier as well as becoming the wearable surface. The weatherproofing will seal small cracks and prevent water from seeping into cracks which will prevent oxidation and deterioration. The seal coat also becomes the top layer which will be worn down over time when vehicles drive and turn on the surface. This wearing down is known as abrasion. When abrasion occurs on the seal coat surface, this means the asphalt below remains untouched and lasting a long time. When the seal coat is applied, it will make your asphalt parking lot look brand spanking new. The thick black color will look fantastic next to the fresh striping job that will be placed on top. Your parking lot will look amazing once complete. ​Keeping your parking lot clean of debris, including rocks, leaves, and dirt, will not only make it more attractive and safer for the cars and pedestrians using it, but it will also extend the life of your pavement. Clearing basins and maintaining proper drainage is another way to add years to your parking lot. Promptly eliminating weeds out of the cracks will prevent long-term, irreparable damage. A full break is a happy, safe, less destructive crack. Oil can cause similar problems as water: breaking down the integrity of the pavement and weakening your surface. Sealcoating your pavement every few years covers a multitude of pavement issues, slowing the natural breakdown of materials and preventing water, debris, and other elements from damaging your parking lot. Maintaining a professional client base is very important to us. We love serving the markets of Tulsa and helping to keep your property looking beautiful. We know that when we come in and make your parking lot look amazing, that it helps with keeping our city spectacular. We serviced all types of businesses in the area and wanted to list a few here just to give you an idea of what we do on a daily basis. If you have a parking lot, we can provide you an excellent service, and we look forward to meeting you soon. We also do warehouse striping, and sports striping too. Here is a list of different types of businesses we serve. ​The one burning question that everyone wants to know is how much it will cost to stripe their parking lot. We would love to discuss pricing with you, and provide you with a free quote. We will need to have a full knowledge of what is required in your parking lot to give you an accurate price. The size of your parking lot, the number of handicap spaces, the number of fire lanes needed, wheel stops, bollards, speed bumps, etc. All of these together will determine the final price. The good news is we have the best competitive pricing in the entire Tulsa area, and we look forward to servicing your business.